Large 4 BR/2.5 BA, sleeps 10. Beautiful lot, close to so much yet private. - Newer matresses and linens. Relax at this beautiful chalet nestled into the pines for that truly relaxing vacation. There is room for 10 in this fantastic 4 bedroom home (three queen beds, two twin beds and queen sofa sleeper). Located within the village of Crystal Mountain. The chalet is located within easy walking distance of the Buck quad chairlift. 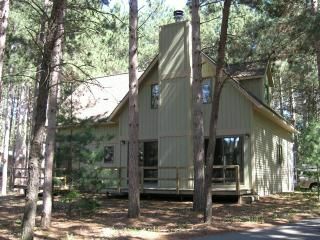 Come 'Up-North' and enjoy the fireplace, 2 person hot-tub, 2 1/2 bath fully equipped chalet. We also now have complimentary access to the Crystal Shuttle Van; 24 hours a day, 7 days a week... AWESOME! We truly enjoy the 'up north feel' and ambience of Crystal Mountain. Secluded, beautiful and tons of stuff to do. I am second generation owner at Crystal and can help you out with any questions you may have. Thanks for thinking of us for your stay. Our family has been going to Crystal Mountain since the mid 70's. It is a special place that continues to improve every year. There is truly a sense of family and relaxation at Crystal. Come to our chalet and experience it yourself. Close enough to everything Crystal has to offer, yet far enough to have a relaxed stay for that 'up north' experience. Use of Crystal Mountain shuttle service; available 24 hours a day, seven days a week. Wonderful weekend; exactly like pictures; would definitely stay again! Clean, well appointed, nicer than the pictures show! The communication with Joe the owner was great. He messaged me back immediately and answered all our questions. There is a shuttle to the lodge but it's such a short, lovely walk, we didn't have to use it. We used all the resort amenities, bars, restaurants, etc. and thoroughly enjoyed that we didn't have to leave the resort property. We had a cozy fire in the fireplace. It's just a beautiful spot! Thank you Joe! Plenty of room for our group of 6 adults and 4 children. The real wood fireplace was great! Nice updated home very close to ski slopes and main lodge. Owner was great and house was well stocked. We just may make this an annual event. Our Family Christmas Ski was amazing. The house easily accommodated our family of 10. Very clean and has everything you need for your stay. Owner was easy to communicate with and readily answered all questions. Great place to make memories. Spent our 2018 Family Christmas Get Away in this cozy home. Plenty of room for 6 adults and 4 children under 5. Lots to do within a short walk or drive. IF you have a price from another property, call and check us out. before you pay too much!!! Weekend Rates: Summer: 550 Winter: 650. Daily Rates: Summer: $200 Winter: $250. Rates shown are for non-holiday time periods. Note: Prices INCLUDE cleaning fee. :o) and all taxes!! !